Mondays are good for Recycling! This was originally posted on 1.31.08. 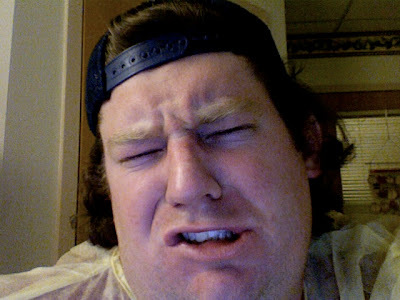 Lately, with the blog, I've been becoming slightly self-conscious. Reading the comments and emails and cards and notes is such an encouragement, but it feels as if I'm being unjustly placed on a pedestal (in other words, many of you seem to think I'm all that and a bunch of raisins, which I'm not), and I'm scared that one day (knowing me, probably someday soon), I'm going to show my true colors and disappoint a lot of people. I'd much prefer to do something preemptive to help lower myself down a little...I am afraid of heights. So, for the sake of honesty and transparency, let me share a few things about myself. 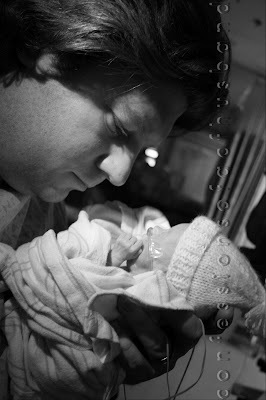 1) I'm pretty sure that being a great dad is going to be a whole lot harder when the NICU nurses are no longer her primary caregivers. I don't think I really need to say much more...see #3 for some more insight into this one. 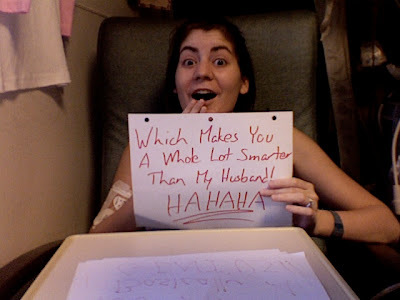 3) I am a much better husband when Tricia is in the hospital than when Tricia is at home. I'm lazy, selfish, procrastinatory (yes, that is a word), and stubborn, especially around Tricia. I do a great job of showing off the best of me when I'm around most other people, but trust me, I'm no saint when it comes to my marriage, and Tricia would be the first to tell you that (although she probably never would tell you just 'cause she's so stinkin' nice). 4) I'm a much better and more prolific writer than I am a talker. I don't talk much (my mom loves to call me "a brick wall"). The only time I really talk a lot is when I'm placed in a leadership role with a group of people. Most other times, I do a lot more listening than talking. And when I do talk, I usually don't have too many brilliant things to say...and, even when I do, I usually don't say it well. For some reason, I feel much more comfortable writing than I do talking. 5) I have never donated blood. I'm very scared of needles that are pointed toward me. 6) This blog has done more for me than is has for anybody else. God knew what He was doing when He put the desire in my heart to journal this journey. I thought it would be a good way to keep our friends and family informed and to help others who may take a similar journey after us. Little did I know that God was going to show our story to thousands of people...and little did I know that He was going to use this blog to change my future in the way He has. You see, back in the summer, around the same time that Tricia was being evaluated for the double lung transplant, I was being diagnosed with anxiety and depression. For several years, I've dealt with feelings and thoughts that have confused and frustrated me. I think and feel and act in ways that I know are not the way I've been called to be as one who lives for and in Christ. Up until a few months ago, I just couldn't imagine dealing with the grief in a "healthy" way, continuing with my faith in God, living a productive life without Tricia. The alternatives just seemed a whole lot easier, on several different levels. And, I've been very scared to talk with anyone about this. But, through watching (with the rest of you) with incredible awe and humility the ways that God has been using Tricia and Gwyneth to change so many hearts and lives, He has also been changing me. God deserves all of the credit for anything good that has come out of our story, and I am just floored that He is using me to tell it. I'll be honest, most of the faith-focused stuff that I've been writing on this blog has been more about me having an outlet to put on "paper" the things that I really need to read and hear to believe are true. Do I totally believe what I mean when I say that I'm trusting God with the lives of my two girls? Of course not! But, thinking it in my head and heart, writing it on this blog for thousands to see, and witnessing the response from you has brought me so much closer to that total faith and trust than I have ever been. When I post things that seem to come from a person of great faith, realize that they're actually being posted for a person with little faith. I think what I'm trying to say is, if faith is always as easy as placing all of our trust in something/Someone all the time, then I'm not really sure that is real faith at all. I sit in chairs all the time (going back to that lazy thing), and I can't remember the last time a chair decided it wasn't going to hold me (although with all of this hospital and fast food, I'm becoming more suspicious)...but I don't think that my faith in those chairs is really anything to write home about. As I've mentioned a few times, it's not so much that I have incredible faith...it's more that I have an incredible God Who has chosen to put me in an incredible situation that only gave me two choices: rely on my own will and strength and stamina, or increase my trust in God. Knowing my own limitations, the choice was pretty simple. When I am at my weakest, He makes His strength most evident. God is using your stories and comments and emails to give me hope for my own life. I know I've said it many times, but I'm believing more and more that, after this part of our journey is over, God will still be Who He is, no matter the outcome. 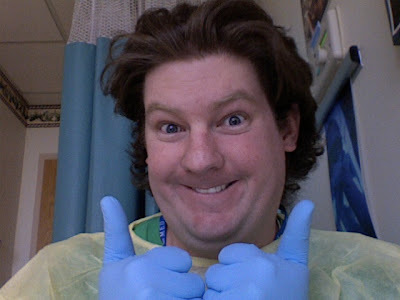 I just received a second phone call (2:09am) from the transplant coordinator. The lungs are "no good". That is all I know. We're are going to try and get some sleep now and look forward to a good day tomorrow. It's been amazing to see the support tonight, especially the huge number of people who came out of the woodwork to comment for the very first time. Thank you all for your prayers and thoughts, and for those of you who mentioned us on your own blogs over the past few hours. We are humbled by the sincere care and support of so many who may never even meet us on this earth. Actually, no update, yet, but I wanted to let you know that... From what I can gather, the fact that we haven't heard anything is a good thing. We've learned that the transplant team is flying out of state to examine the lungs and donor. We may not find out for sure if it's a go for a few hours, and the surgery would not take place until at least early tomorrow morning. They are getting Tricia ready. She has already given about 15 vials of blood and has had an EKG. Please, also be thinking about and praying for the donor's family. Even if this isn't Tricia's match, somebody has died today willing to give the gift of life, for which we are always thankful. I'll update again when I learn more. We just got a call from the transplant coordinator at 6:26pm. They have a pair of lungs that could be a match. They're checking them out now to be sure, and the nurses are getting Tricia ready. It could be a dry run, but we're hoping that Tricia will be in surgery within the next few hours. Tricia is very excited and anxious. We've contacted our family (or left messages). Thank you for your thoughts and prayers right now. I'll update as soon as I hear more. I've written about the philosophy of the song below several times. This is perhaps my favorite song that we sing at our church back home. I pray that this might be what others will say about our story when it is all said and done. Please, please, please, do NOT come by the hospital to visit/meet us unless you've contacted me ahead of time, AND I've said it's OK. The hospital, especially Tricia's floor is our home right now, and, while we do appreciate the good intentions, it's incredibly awkward to have somebody (especially total strangers) come by unexpectedly and expect us to be OK with it. We very much appreciate those who have come by to visit (especially those who have asked permission ahead of time). > Tricia's lungs have been hurting for the past few weeks. It's hard to describe, especially since most of us (myself included) have never experienced this kind of pain, but it's usually a sign of an infection, even though the cultures have yet to really show anything. The pain can be debilitating (even for her). > Tricia has been taking some sleeping meds at night the past week, but it is not helping very much. She needs her sleep at night so that she can be as active as possible during the day. Thanks for your continued thoughts and prayers for us! I've received several comments in the past few days of people asking either personal questions or requests (related to Great Strides, photography, offering us help, etc.) and then asking me to contact them...but they don't leave any way for me to contact them. Since I don't like to respond to most of these kinds of things on the blog, your best bet for inquiring about something more personal is to email me. Tricia's window is directly under the path that the medical helicopters take when landing on the roof at Duke. We hear and see every single one. 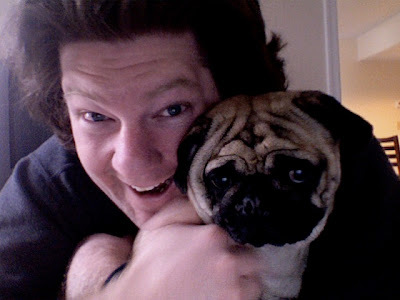 Every time, I wonder if this is the one that is carrying Tricia's new lungs. We've been told that the transplant team has received several offers for Tricia, but none of them have been the right match for her upon deeper examination. Being at the hospital has its blessing in that we don't have to worry about "dry runs". A dry run takes place when the hospital calls you to say that they have a potential match and would you please come in to be prepped...but the offer eventually doesn't pan out. Some patients make it all the way through surgery prep before being notified that the donation is not a good enough match. We've been told (and can only imagine) how much of an emotional roller coaster this can be. 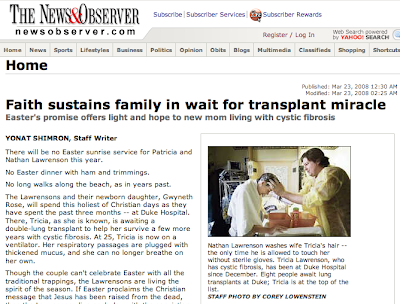 We've talked with some transplant patients who have had multiple dry runs. But, because we are already at the hospital, the transplant team has some extra time to determine for sure if an offer is the right match for Tricia, which means, hopefully, we will only be receiving one call. Until then, we'll continue to listen for the helicopters. I'm In Love With Two Fat Girls! Tricia is weighing in at 123lbs, which, except for matching her top pregnancy weight, is the most she has weighed in a few years. Gwyneth has reached 1 kilo (1000 grams), which is a great milestone! 1015 grams, or just under 2lbs 4 oz. to be exact! Gwyneth got her first partially-submerged bath a few nights ago, and I got to help! She did not enjoy the bath, but she loved the hair drying brush, and I loved her hair! Just thought I'd let you know that I posted some new pics of the Duke Gardens and a few other things over at my Photo Blog. 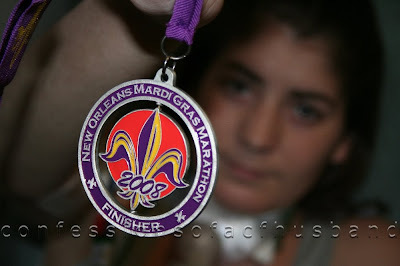 Remember Kelly who ran the New Orleans Marathon in Tricia's honor last month? Well, she secretly (secret to us) asked the officials if Tricia could receive an Honorary Finishers Medal. It came in the mail with some other cool stuff the other day...it made Tricia's day! 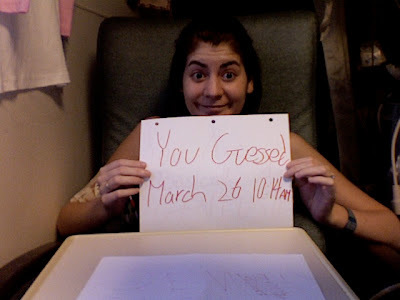 At 2pm today, that's exactly how long it has been since the last time Tricia walked through the front doors at Duke to be admitted. Literally, exactly at 2pm today, Tricia was sitting outside Duke, as close to those same front doors as she has come in the past 3 months. I don't know why I'm writing this, but I thought it should at least be acknowledged. I was just surfing the web, checking out what people are saying about us, and I came across a public site on which our mailing address was posted for anyone to see. PLEASE, PLEASE, PLEASE, do NOT post our mailing address anywhere, and if you already have, PLEASE, PLEASE, PLEASE go back and DELETE it!!! You wouldn't want anybody and everybody to have access to your mailing, and neither do we!!! Those who might want our mailing address need to email ME and ask for it. Gwyneth Rose did great with the laser eye treatment. She'll have another exam next Tuesday, but it may be two weeks before we really know if the treatment is helping. Even with the best outcome, she will probably have slight problems with her extreme peripheral vision, which should not be an issue unless she wants to be a fighter jet pilot. Tricia is feeling better, but is getting a little anxious to get out of here. We just got back from spending about 45 minutes outside, which she always looks forward to, and hopefully we'll get to visit with Gwyneth together later today after she (G) has got the sedatives out of her system. 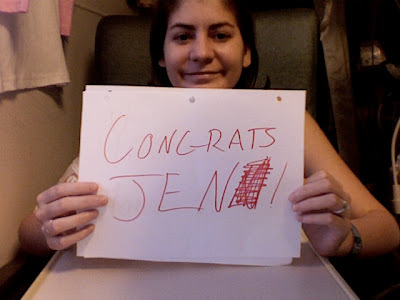 > Currently, my Personal Great Strides Fundraising Total is at $573, which is about 5% of my goal for September 13. It is updated on a regular basis by the CFF. It's quick and easy to donate online if you're looking for a way to help us find a cure for this disease! > As I explained Here, I give myself about 1.5 haircuts per year. I usually cut my own hair, but get my personal barber (hey Steve!) to cut it if I want something other than the buzz. I did cut hair in college, and can do a good job with more than just the buzz if it's not my own head. > I have cut Tricia's hair, but just a trim a few times to get rid of her split ends. I'm scared to do much more...if I screw up my hair, I just cut it a little shorter and it's good to go. And, mad props to my friend anita for catching the nod ("I was hot") to Napoleon Dynamite in my Haircut Post (also, the song is from the Nacho Libre soundtrack). I'm headed off to the Duke Gardens to get some photos of all of the trees and flowers in full bloom! 10:54am - Gwyneth should be getting the laser eye treatment on both her eyes right now. I'll know in about an hour how it went, and we'll know in about two weeks if it has helped. I'll be meeting with the eye doctor (I know there's a medical term, but it's late) tomorrow (March 27) at 10am as she gives Gwyneth another exam. If things aren't any better with her Retinopathy of Prematurity, she'll probably undergo a laser eye treatment on both eyes following the exam. This is a fairly common occurrence with micro-preemies, and by far, not the most horrible thing that could be going on with Gwyneth right now, so we are not worried. The laser surgery is slightly uncomfortable, but she will be sedated and will be feeling fine shortly after. Whether everything looks good at the exam, or the laser eye treatment takes care of the problem, we know it's all in God's hands. We appreciate your thoughts and prayers concerning this. And, Gwyneth has gained a few ounces in the past few days, which is awesome news! You are still a little bit bigger than 12 inches long, and you weigh a little more than 2lbs!!! Your eleventh week was a good one. 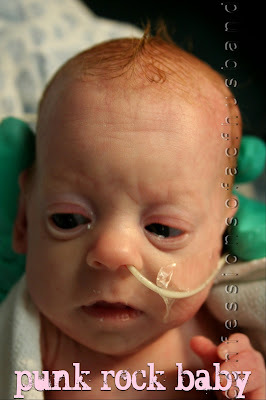 You stayed on the nasal cannula all week, and even spent a few hours breathing completely on your own. You love to eat, and you get a little cranky when you get hungry. You are becoming more and more alert, and you are even able to focus on objects for a few moments at a time. All you need to do is start gaining more weight. Your mommy was able to visit with you nearly every day, and she is feeling better than she was last week. 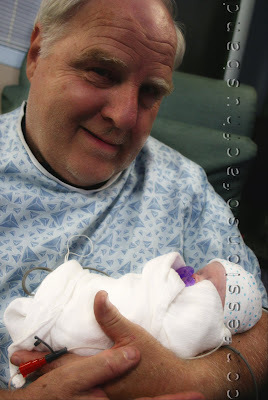 Your daddy was able to start Kangaroo Care with you again, and the old guy with the white hair who doesn't have a name yet held you for the first time! And, you celebrated your first Easter. 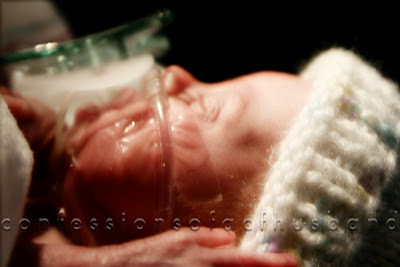 In the next week, we're praying that you'll really start to gain some weight, that your eyes will be problem free and that you'll be free of the nasal cannula forever! I'll take the time later to look back through the contest and determine the winner, but for now, I'm hosting a blog party. No drugs or alcohol, please! I'm bringing the root beer floats! This story aired last night on NBC Nightly News. It was filmed on Monday (I just missed being on camera again...). Dr. Goldstein is one of the many looking after Gwyneth. 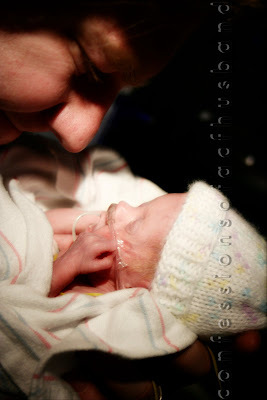 The shots of the mothers with their babies are from the NICU. We feel so incredibly blessed and humbled to be given the two opportunities this past week with The News & Observer and ABC 11 to share our story. It has been one of my biggest prayers throughout this journey with Tricia and Gwyneth that God would use us (our joy and our pain) for anything He chooses. I've been specifically asking that God would give us the the grace and wisdom to step through any door that He opens for us to share our story, no matter how large or small. Having (myself and other family) been in the newspaper and on TV before, I know that it's very common to be easily (whether purposely or not) misquoted or misrepresented. Fortunately, we were very confident that both Yonat (of the N&O) and Barbara (of ABC) would portray our story accurately and beautifully, and we were not disappointed. Both women (and respective employers) displayed a sincere interest in personally investing, not only in our story, but in our lives, and this made for very enjoyable experiences. And, we were especially impressed that both women (and especially employers) not only respected, but even focused on what we consider the true center of our story...the God Who has proven our faith to be real. That is, unfortunately, all to uncommon in today's PC media. I have already heard from hundreds of "new" people, via email, comments and even a few conversations in the halls at Duke that the recent media coverage of our story is impressing many things upon their hearts, not the least of which is a willingness to consider the ordinary miracles of every day life. Again, thank you so much to all of you who, through your willingness to spend even just a few minutes with us and your compassion to share our story with others have helped to open these doors for us. Each one of you are now a part of our story, and we are now a part of yours. Please, take a few minutes in the next few days to consider that your own story has the potential to change lives, perhaps even more than ours has. No matter your place and position, your successes and failures, your loves and your losses, you can share the ordinary miracles of your own life (and, I promise you have some) and be a blessing to those around you. I've received thousands of emails over the past few months, and have responded to every single one (except to those few people who email me a lot...I just respond to you every now and then to let you know I'm listening), even if it was just with a simple, "Thank you." 1) Your email got lost in space and I never received it. 2) My response to you got lost in space and you never received it. 3) My response to you got sent to your "junk" folder (I check my junk folder a few times every day and always find an email or two that shouldn't be there). So, if you sent me an email, especially recently, and you never received a reply, check your junk folder and/or send it again. For those who do not live in our area, or those who just want to watch it again, Here is the video! Just saw the preview of our story on ABC! Should be airing in the next 30 minutes! Not sure if this the transcript of the video, but Here You Go! The Cystic Fibrosis Foundation has finally created their own channel on Youtube where you can view all of their videos. I'm hoping that the piece will be up on their website as well. Just remember, the camera adds 10 lbs, yellow's not my color, and I was having a bad hair day that day...haha. The NICU medical team is becoming concerned about Gwyneth's weight. 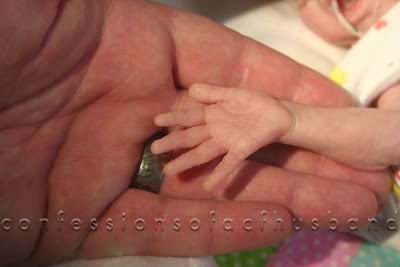 She is now nearly 11 weeks old, more than 35 weeks adjusted (gestation) and well below the growth curve for micro-preemies born at 24+ weeks. 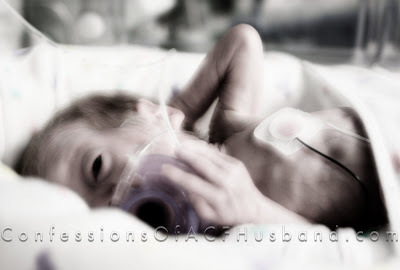 She weighed 1lb 6oz at birth, and has only gained a little more than 10oz since. While she may look bigger in the pictures (10oz of 32oz/2lbs is a large percentage), it has really only added a little bit of that baby fat and not much of any substantial growth. Because she has been relatively healthy otherwise, it has not been such a concern until now. Lack of growth is usually accompanied by other serious issues, but she continues to breath well, eat well, and show good signs all around. They are taking precautions to insure that she burns as few calories as possible, including keeping a close watch on her effort of breathing and limiting the amount of time we hold her (moving/holding preemies can cause them to burn extra of calories). 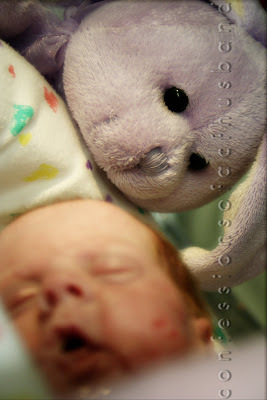 We have not done Kangaroo Care in the past several weeks because of the contact isolation and then the scare from last week, but I will begin doing that again within the next few days as evidence shows this can often stimulate growth. Because of her small size, we are probably still looking at a few more months in the hospital with her (as apposed to having hoped to be released near her original due date of April 24). The good news is that she is developing well on the inside. 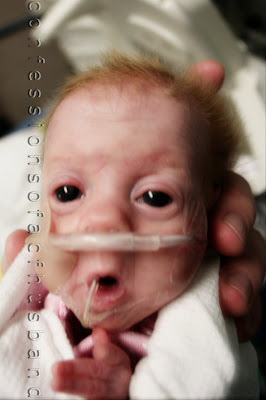 Her lungs and other organs are developing as a healthy rate. Also good news is that she spent most of the past day without any breathing help. Click Here to read the article online (make sure you click on "Photo Gallery" as well)! Our story made the front page of today's Sunday edition of The News & Observer newspaper here in Raleigh/Durham! Yonat Shimron (writer) and Corey Lowenstein (photographer) did an incredibly outsanding job of capturing our story in words and photos (respectively), and we thank them for the hours they spent with us (and, obviously, many more hours spent in research, composition and editing) over the past few weeks. We are humbled to have this opportunity to share our story, and we pray that God will use this and other opportunities to show Himself and bring our passion for awareness of and support for Cystic Fibrosis, Organ Donation and Premature Birth to the minds and hearts of even more compassionate people. It's been exactly one month since Tricia was listed, which was about the number of days that our doctors told us to expect to wait. We've been told that the weekends are the best days for receiving the call. Again, tomorrow would be a great day for this miracle of life through death, but as always, we pray for God's will, knowing that His plan is always best...just, maybe, tomorrow will be the best for Tricia. Tomorrow, Tricia and I will join with millions of others as we remember the Death and celebrate the Life of One so long ago that has given the hope of Life for All. I wanted to write something about the meaning and importance of Easter to Tricia and I, but I remembered this post and really couldn't think of anything that I could say better than what has already been written. The following was originally posted on 2.22.08 (exactly one month ago, the day Tricia was listed). Death is a reality of life. Depending on your views of God, family, religion, life, ethics, etc., you may look at death in a different way than we do...but none of us can deny that the physical death of our bodies is inevitable. Organ Donation, whether from a living or deceased donor, is perhaps the greatest gift one person can give another. Today, we have celebrated the fact that Tricia has been activated to receive a double lung transplant. We celebrate because Tricia is being given an opportunity to continue living beyond the next few months. We celebrate because there are people in this world who have chosen to use their death to be a blessing to others. A healthy organ donor can be a blessing to up to 7 different people through their death. Today, 78 people (in the US) received the organ donation that they have been waiting for. It is for these reasons that we celebrate. But, for Tricia and the nearly 100,000 other patients waiting for an organ donation to continue living, people who have made the choice to be donors have to die. And for those people (and their families) who gave the ultimate gift yesterday, today and tomorrow, we say "thank you" with all sincerity and humility. We do not celebrate the death of an organ donor. But, we do celebrate their gift of life. We do not pray for a donor to die (God knows that death doesn't need any more of our "help"). But, we do pray that through their gift of life, their family is going to be helped in their grieving process because of their loved one's gift of life. We have been waiting for this day for a long time, knowing, as much as humanly possible, all that it means for us and the donor and our families and friends. We have also been praying for the donor and family and friends for just as long. We ask that you pray and think about Tricia's donor with us. For some more great insight on how to do this, please take a few moments to Read This. I've been spending nights in the hospital for a few years, now. The only option that Duke offers for sleeping guests of patients (at least in our experience) are the reclining chairs. I've "slept" many nights in these chairs, but they have always killed my back and left me exhausted. I am currently sleeping at the hospital about 2 out of every 3 nights, and, about a month ago, I finally got smart and went to REI and bought a $30 cot and a $10 egg crate foam mattress topper...best $40 I've ever spent (except for Tricia's engagement ring...haha, just kidding). If the chair was a 3 out of 10 on the comfortable sleeping scale, the cot + foam is only about a 5, but the difference between a 3 and a 5 is incredible when you're basically living in a hospital. Anyway, I just thought I'd share that, especially for those of you who may have a need for such information at some point. PS. The cot is aluminum, so it's extremely light and very easy to set up and tear down every day. Gwyneth continues to do well. She's gained a little more and is distancing herself from 2lbs! 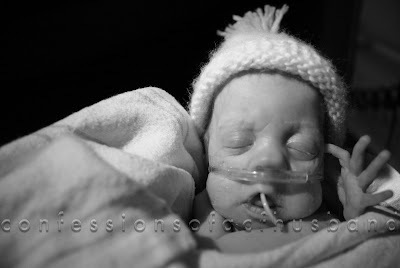 She continues to do well on the nasal cannula and with her feeds. She's really starting to show her personality...she gets very upset when her tummy is not being filled with milk (just like her mother, haha). Tricia is feeling a little better today. Still on lots of antibiotics, but she is not coughing as much, which is a good sign. She's been video chatting a lot with her sisters and other family, and she walked several laps around her hall again today. Another Bake Sale on the 7th floor today made over $600 for CFF, and the Raffle I helped out with made over $200! Watch all of the CFHusband videos Here! Warning: the linked article contains some discussion about some adult situations that aren't suitable for children to read. This is a great glimpse at the lives of CFers. Every person with a chronic disease must decide what kind of balance between quality and quantity of life they will live by. Risks. While we are extremely cautious and consider everything that we do (when our lives are more "normal"), Tricia has always been willing to take a certain amount of risk to have a greater quality of life (being able to enjoy life), knowing that the consequences could shorten her quantity of life. Even something as simple as going out to eat or riding in a friend's car could have monumental affects. And, with a double lung transplant, we're going to have to take even more precautions. But, fortunately, transplants also give people the opportunity to live longer and fuller lives. 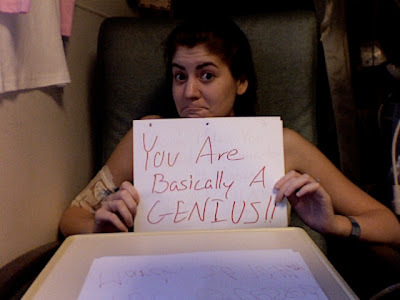 When Tricia was young, and a patient at CHOP, CFers were often placed in the same room with each other. Although we now understand how dangerous that was for them, it was a great experience for Tricia, helping her to be more willing to share about her disease with others. Many of her friends from those days are no longer alive (whether or not to do with the living conditions at CHOP at the time is unknown). Because of the CFF and the millions who have donated, we now understand, more fully, the risks that are involved with this disease and the care that can allow CFers to live a more normal life. PS. Bill Taub (quoted in the article) is on Tricia's CF Team and a very good friend. I'll be hanging out with him tomorrow, probably near the food court in Duke South, talking with people about CF. So, here's the story of how our Great Strides Walk came to be. Tricia's family has been participating in a Great Strides walk in April/May in Medford, NJ every year since Tricia was in elementary school. In 2002, about a year after we started dating, I joined their team, and through 2006, Tricia and I participated with about 20 of our family members. After we were married in 2004, I began to have a desire to become more actively involved in these events, but it was difficult because we were still attending the walk in NJ. There were two walks very near Portsmouth, VA (where we lived our first two years of marriage), but it was more practical for Tricia and I to drive to NJ than it was for most of her family to come down to us. A few months after moving to Nags Head in June of 2006, I contacted the national CFF via email, asking about how I could help start a Great Strides Walk somewhere on the OBX. The nearest walks at that time were in Chesapeake, VA and Raleigh, NC. My goal was to help organize an event and get the ball rolling that first year, and hope that somebody else would pick up the ball and take over for future years. A few days later, I received an email from Jane at the Raleigh CFF office. We set up a meeting for a few weeks later when Tricia and I would be visiting Duke. Jane explained everything that would be involved, and we agreed to go for it. We were placed under the guidance of Sophia Olson of the Raleigh CFF, and Tricia and I began recruiting family and friends to help us. We set a goal of $15,000, which later became $20,000. Sophia provided us with all of the resources and ideas and help that we needed (and, she has become a good friend as well!). We got a later start than most, and had our kick-off party in January of 2007. By the time of the walk, we had about 30 people on board helping out. We got our local newspaper involved, publishing pictures and even a few stories about Tricia and the walk. We used local radio as well. We received several large money, food and drink donations from large corporate sponsors. > Free pizza, subs, drinks, frozen custard, candy, etc. > A 1 mile walk that lasted about 45 minutes. The even officially went from 9am to 1pm, and despite some sketchy-looking but perfect weather, we guestimated that 150 to 200 people stopped by for at least part of the event. We raised over $30,000. Every walk is different, although, I'm sure, every event is just as fun. This year, our friends and family back home are organizing the September 13 walk without us, and Seth Soria's family and friends are organizing a similar walk in Elizabeth City on the same date. Again, if you want more info in organizing a Great Strides Walk or other CF Event in your area, please Contact the Cystic Fibrosis Foundation. Most walks are taking place in the next 2-3 months, so sign up today and help us make Great Strides in finding a cure for CF! I've had several people ask me some specific and general questions about Great Strides. As always you can learn a lot more a lot faster by doing your own research (Click Here), but here is some info off the top of my head. > If there is not a walk near you, you can Contact CFF and offer to help organize a walk for your community. 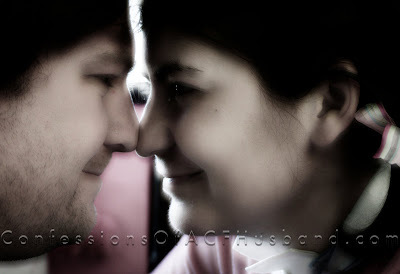 This is what Tricia and I did a few years ago...I'll tell you more about that story later today. 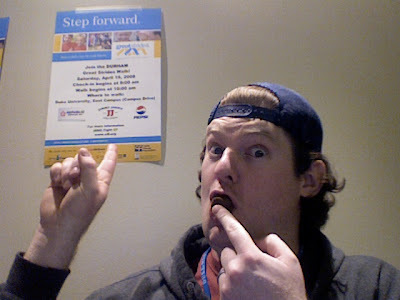 > If you're planning on attending a walk, I highly recommend that you pre-register online. This will help CFF know that you're coming, and it will give you access to a lot of helpful info and resources if you're wanting to raise money and involve others. > Most "walks" are only a few miles or even less (and, you don't even have to walk if you come). Great Strides is different than some other big name fundraisers in that you don't ask people to donate per mile, but to simply donate any amount possible. The goal of the day (and the process) is to raise moneys and awareness about CF and to have fun doing it. All of the walks I have participated in involve a whole lot more than just the actual walking part. > Anybody can register online, even children (although I suggest with the help of a parent). Raising funds can be as easy as sending out an email. > If you're registering to walk, you may use our names and story and web links and even call us your "friends" on your Great Strides home page and/or t-shirts etc. if you think it will help you raise funds and awareness. You may even name your team in honor of Tricia and/or Gwyneth (a few people asked about this). Just don't be a crazy stalker person. Make sure you Click Here to see the other posts in which I've mentioned Great Strides. Especially check out the posts from last September. Congrats to Sallie! Tricia liked several, but yours was her favorite! And now they're the Lawrensons THREE! Sallie, put one of your hands close to your computer screen and then hit the play button for a High Five from Tricia. Exactly one month from today, I'll be making Great Strides for CF here on the Duke University campus. If you can, consider coming and hanging out with me and thousands of others as we enjoy some free food, games, a raffle and lots of other fun activities! Registration officially begins at 9am, but feel free to come out any time that morning or early afternoon. I'll be the one wearing the orange shoes. In fact, there a several Great Stride Walks taking place in the month of April all over the country. Click Here to find the walk nearest you! 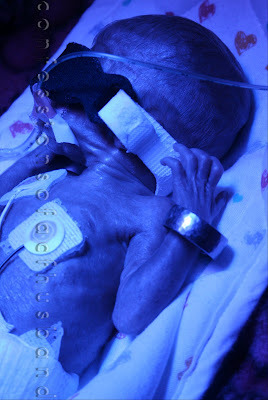 You are still a little bit bigger than 12 inches long, and you reached a big milestone by finally making it to 2lbs!!! Your tenth week was very interesting. You started off by deciding that you need a break from breathing on your own, so they put you back on the vent. 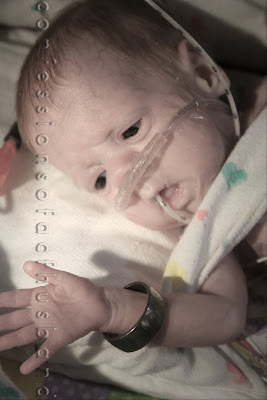 But, just within a few days, you moved to the CPAP and then back to the nasal cannula! And, you really love sucking on your pacifier. You spent all week in the same room, out of contact isolation. 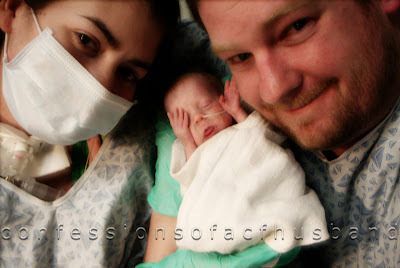 Your daddy was able to hold and touch you, and you even made you first live internet debut while some of your family looked on! Your mommy was able to visit with you a few more times as well, although she's a little sick now and hasn't been able to see you the past few days. In the next week, we're praying that you'll continue to grow and and experience more new things! Gwyneth has finally reached 2lbs! Hopefully she'll keep growing and not look back! She also had another eye exam today, which looked about the same, so they'll give her another one next Tuesday. This is good news that the condition has not grown any worse. 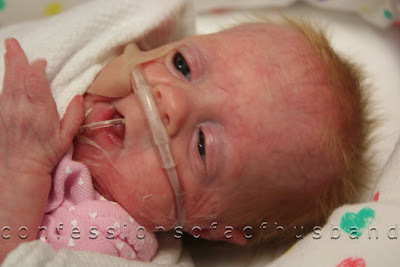 She continues to thrive on the nasal cannula, and she is eating more and more almost every day. Tricia is about the same as she was this morning. Thank you for your prayers. The bake sale went great. 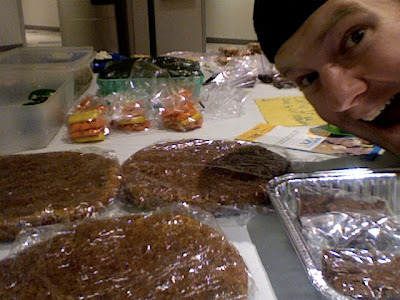 I know that we made over $500, and I'm thinking it was close to $600, which is good for a 4 hour bake sale! A dude named Chris who reads the blog stopped by just to hang out for a bit, which was cool. Unless something else comes up, I'll also be helping with a raffle and talking about CF here at the hospital on Friday as well. I'll let you know where if anyone wants to swing by and say hey and help us out. Last week, Yonat Shimron, the religious reporter for The News & Observer here in Raleigh came by to interview us for an article she's writing for Easter. Corey, a photographer for the paper came by today. The article should appear in this Sunday's paper, and I'll post the online link for those of you who aren't in the area. The TV interview is coming together and should air soon...I'll keep you posted! Tuesdays are good for Recycling! This was originally posted on 1.11.08, just 3 days after Gwyneth arrived, while Tricia was still in her medically induced coma. If you have a few hours to kill and want to be encouraged, Google "Tricia Cystic Fibrosis", "cfhusband" or "Confessions of a CF Husband". I've read as many of them as I can find, and have posted "Thank you!" on every single one (except for those that don't allow me to). As I've read each comment on those other blogs, I've come across a few that have mentioned how "sad" our story is. I couldn't disagree more. Sad is the furthest emotion from my heart these past few days and weeks. I have never experienced so much joy packed into such a short period of time in my entire life. I've seen members of my own family return to God, heard from couples who have considered their marriage more deeply, read of mothers who have hugged their kids more tightly, seen Duke staff by Tricia's bedside in prayer, witnessed the increased faith in a real and tangible God of so many strangers and friends, and been told of people coming to know my God for the very first time...all because He has chosen to use Tricia, and now Gwyneth in an eternal way. This is a story of Hope in the future, Joy for the present and Blessings for the past. It is a story of a God Who takes a left turn just as you are moving right, Who shows you the mountain top while others see the valley, Who never leaves nor forsakes you, and Who is bringing you to a destination that is unfathomably beyond anything you could have desired for yourself. The past few days have led me to the most foreign places (physically, emotionally and spiritually) I have ever experienced. And yet, every single moment, I have felt a peace and sense of purpose like I did not know existed. It is something that I absolutely cannot understand or explain. Although I have recently asked God for many things He has not yet given me, I would not trade a moment of this past week for anything in the world. My bride is living and, I believe, on her way to a successful double lung transplant and many years of watching our baby grow with me. I have a miracle daughter who is seriously challenging her mother for the top love in my life. Our families have shown me pieces of their hearts that I have never seen before. Strangers have become eternal friends, old friends have become new again, good friends have become great friends, and the best friends have become like family. The only sadness to this story is that you might be reading this right now without relationally knowing my God like I do. But, that can change in an instant if you want it to by simply expressing to God with your heart that you believe in Who He really is and desire to know Him now and forever. If you could only see the way Tricia smiled today when she heard my voice and feel my heart jump into my throat like it did that first day we met over 7 years ago or see the tears that flood my eyes whenever I touch Gwyneth, you would believe and know that there is no room for sadness in my life right now. Our story could change at any moment, with an outcome that I may not be able to deal with on my own. But, my God will never change, and neither will my memories of this past week. Tricia asked me to post these few things. Thank you for your prayer and kind thoughts today. > She has had some pain in her lower left lung for the past few days. This is often a sign of infection. > If she does have an infection, that it will go away. > Because of the pain and more frequent coughing, she has not been sleeping as well the past week. This makes for long days and long nights. > As always, that her new lungs will arrive soon! I've begun a new blog. I've been creating a few websites for some photographer friends of mine, and I was inspired. Mine is basically just for fun. 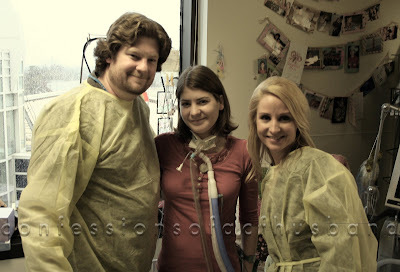 Awesome Story of CF and Organ Donation! Here's a story of a young woman who was inspired to become an organ donor by attending a Great Strides Walk for CF. At the age of 15, her lungs saved a CFer's life. This is why I blog. Read with your best Irish accent! You have until 8pm (EST) tonight to come up with your own CFHusband limerick! Keep it G rated and CFHusband themed (or I'll delete it). Or, write one about yourself and post it on your own blog! Tricia decides who's is the "best" and will give the winner a cyber high five! As Gwyneth grows older and stronger, and now that she is out of contact isolation and I can touch her again, it is becoming easier and easier to spend more and more time with her. But, that means I'm spending a little less time with Tricia. Usually, this isn't a big deal. 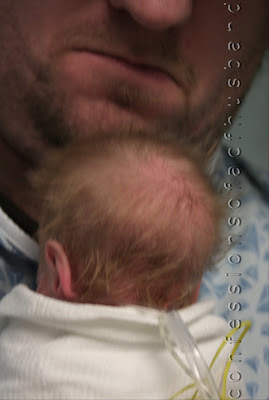 But, my favorite time to go down to the NICU is late in the evening because I'm usually one of the only guests down there, and everything just seems a little more quiet and peaceful. And, usually Tricia's favorite time to have me around is late in the evening when she's beginning to settle down for the night, wanting to talk and snuggle (as best I can with my gown and gloves). Tonight, like most nights, I headed down to the fifth floor to check in on my baby girl. I told Tricia that I would just be a few minutes, wanting to just say goodnight and take a few pictures before helping Tricia fall to sleep and then pulling out my cot and going to sleep myself. Gwyneth is becoming more and more lively, and seems to be spending a little more time awake these days. And, she's beginning to already learn that an empty stomach is an opportunity to voice her opinion about things, with her tiny, raspy cries. Tonight, just as was about to head back upstairs, she decided to wake up and let us all know that it was time to eat. I just couldn't leave her while she was crying, and her nurse was busy helping another baby and mommy, so I stuck around for about 45 more minutes, talking to her, holding her pacifier in her mouth and trying to help her find a comfortable position between the red-faced cries (and getting a few photos, like the one above). All the while, glancing at the clock and knowing that Tricia was wondering where I was. 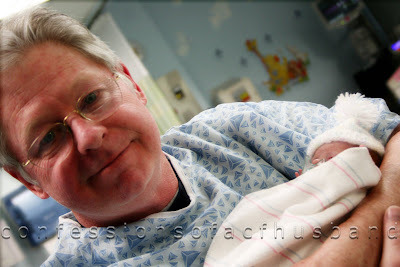 I finally pulled myself away, as her nurse was finishing up with the other family...I could still hear Gwyneth's faint cries through the plastic incubator as I walked out of her room. I had a few tears myself, feeling guilty both for leaving my baby girl and for being gone from Tricia much longer than I had promised. By the time I finally got back to Tricia's room, she was just falling asleep, with the lights out and her fan on. I missed the opportunity to be with her, not knowing how many more nights I might have to talk and snuggle and watch her fall to sleep. 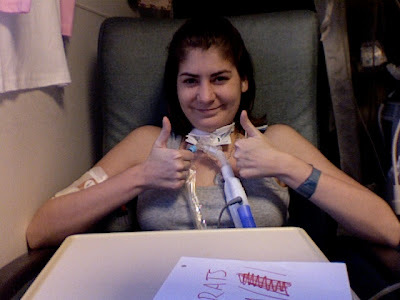 I found this at Breathing Deeply: My Life With Cystic Fibrosis. You may not fully enjoy/understand this unless you're a CFer or family/caregiver. I'll be helping out with a Bake Sale to benefit the CF Foundation. From 12 to 2 on Tuesday afternoon, I'll be hanging out on 5300. If you're in the area, please, feel free to stop by anytime from 10am to 2pm and say "hi" and help us in our search for a cure! Thanks to Bird On A Wire for making us their "Remarkable Bloggers" for this week! And, thanks to all of you, again, who have linked us on your own blogs, websites, chat rooms and have helped us further the Purpose of this Blog! This Contest is now Closed! The winner will be announced sometime shortly after we reach 2 million hits! Thanks for participating! Ready for another contest? This one is just for fun! The hit counter just passed 1.75 million hits. Let's see who can guess the exact day and hour and minute (EST) that we will reach 2 million. 1) You must choose a day (ex. April 21)...we'll assume you mean the year 2008. 2) You must choose a time (ex. 2:24am)...we'll assume you mean Eastern Standard Time. 5) This contest will close on Monday, March 17 at 12:00pm (noon) EST. The prize this time is slightly more substantial than the prize for The Last Contest. Meka & I will be cheering you on! 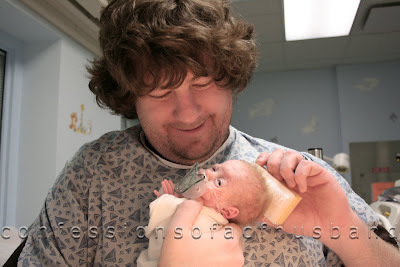 So, I love the whole blog thing, and because of our life here at the hospital, I have a lot of time to blog and a lot of stuff to blog about. 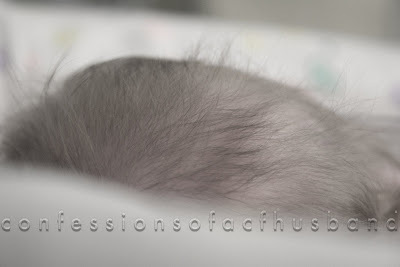 But, sometimes, I feel like I blog so much that some of my most important posts get bumped down so quickly that a lot of people might not get the chance to read them all, which I don't love (and, which is partly why I love the word "bump" so much). So, tell me what you think. Try to answer the following poll based on how much you actually read of my blog. If you don't read it all, tell me that I blog too much. If you read it all and can't wait for more, tell me that I don't blog enough. If you have just enough time and energy to read all or nearly all, tell me that I blog just the right amount. I had the comments disabled for some reason...please feel free to let me know why you voted the way you did. > Send Tricia and Gwyneth an ECard. These have already been coming in. You send an email message to Duke, and they print them off (one per page) and bring them to our room. You can make a huge statement about Tricia's miracle and get even more people involved with your messages. Use "7800" for their room number. > Send a card or package. Ask for our address by sending me an Email. > Consider becoming a member of "Team Patty Sue" by financially donating to Tricia's Trust Fund. All moneys donated go directly into helping finance everything involving Tricia's CF (including the pregnancy/premature care). This trust fund is a few years old, and we are literally debt free so far because of the donations of hundreds of friends, family and loving strangers. > (This is the best option, IMO) Take a few minutes to visit my Great Strides Home Page and consider either donating or signing up and becoming a member of our team and helping me reach my personal goal of $10,000 by Sept. 13, 2008. Every dollar raised here will go directly to CF research. > DON'T send flowers/plants. Neither Tricia or Gwyneth can have any flowers in their rooms, and I only spend sleeping hours at our hotel, so nobody would be able to enjoy them. > DON'T send stuffed animals/toys. Stuffed animals/toys are a great breeding ground for dust and germs. 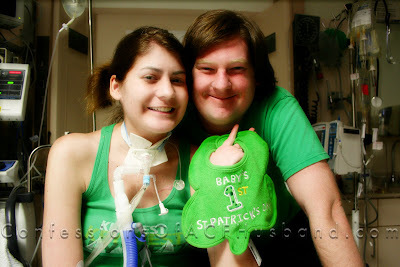 Tricia's CF and upcoming double lung transplant will not allow us to have many of these things in our lives. > Don't send live animals or spiders. That's just silly. Back on the Nasal Cannula!